The force acting perpendicularly on a surface is called the thrust. It is a vector quantity. The SI unit is Newton (N). One Pascal pressure is defined as the pressure exerted on a surface of area 1m2by the thrust of 1N. Let 'F' be the force acting perpendicularly, 'A' be the area and 'P' be the pressure exerted. Pressure is directly proportional to the force acting perpendicularly. The value of atmospheric pressure decreases as the height from the sea level increases. It is difficult for us to survive on a very low atmospheric pressure. As the pressure of air and the blood pressure inside our body is about equal, we do not feel the normal atmospheric pressure on our body. The air pressure is maintained artificially for the passengers, convenience inside airplanes. At very high altitudes, nose, ears, and eyes may bleed due to less atmospheric pressure. We can measure the atmospheric pressure by using barometers. There are mainly two types of barometer: Mercury Barometer and Aneroid Barometer. We discuss mercury barometer in this unit. Mercury barometer was invented by an Italian physicist named Evangelista Torricelli. It is also known as a Torricellian barometer. The barometer consists of one long glass tube filled with mercury. The upper end of the tube is closed and has vacuum above the mercury. There is a mark of scale at the side of it. When the atmospheric pressure increases, the mercury level rises in the tube and when the atmospheric pressure inside decreases, the mercury level falls down. This is the way in which the instrument measures the atmospheric pressure. There are many instruments which are based on the atmospheric pressure. Some of them are: Syringe, Air Pump, Water Pump, etc. Here is the short description on the structure and working methods of these instruments. A syringe is an instrument used in medical field to inject medicines in patients’ body. It is made up of plastic or glass. It has two parts: cylinder and piston. The cylinder is a hollow pipe-like structure connected with a nozzle at one end and open on the other end. The nozzle is fitted with a needle and the piston is adjusted inside the cylinder. The piston can be moved inside the cylinder. The Syringe works by the repetition of two processes: Pulling the Piston and Pushing the Piston. - When the piston is pulled by keeping the needle inside the liquid, the volume of the cylinder increases and pressure decreases there. In this condition, the atmospheric pressure pushes the liquid inside the cylinder. - When the piston is pushed, the volume of liquid inside the cylinder decreases and the pressure increases. It pushes the liquid out of the syringe. An air pump is a device used to pump air in balls, toys, tyres, stoves, etc. It can be hand-operated or machine-operated. The structure alongside shows a hand operated bicycle pump with its major two parts: Cylinder and Piston. The cylinder is a pipe like structure connected with a nozzle fitted with the tube of a bicycle. The other end is opened through which a piston is passed inside. It contains a handle, a rod, and a washer. The washer is made soft by applying oil or grease on it and it works as the valve for the pump. The grease also reduces friction while the piston slides in the cylinder. The air pump works by the repetition of two processes: Pulling the Piston and Pushing the Piston. - When the piston is pulled, the volume of part A increases and it reduces pressure in this part. The air of part B at the atmospheric pressure compresses the washer and passes into A. At this time, the valve of the bicycle is closed which blocks the air of the bicycle wheel from coming out. - When the piston is pushed, the volume of part A decreases and it increases pressure in this part. The increased pressure spreads the washer to stop the passage of air from A to B. The part of ‘A’ enters the bicycle’s wheel by opening the valve. A water pump is a device used to pull water from the well. It can be used to pull the underground water. It consists of four parts: cylinder, piston, pipe, and handle. The cylinder is a hollow pipe having a spout at its one side. Its one side is open and the other end is connected with a pipe. There is a valve (valve A) at the joint of the cylinder and the pipe. The pipe is taken to the source of water. A piston is fitted inside the cylinder. The piston contains a rod, washer, and valve (valve B). The outer end of the rod is connected with a handle. The handle is a first class lever that is used to pull or push the piston. A water pump pulls underground water through the repetition of two processes: Downstroke and Upstroke. Downstroke: Downstroke of the piston is the condition in which the piston is pushed down when the handle of the water pump is lifted up. In the condition, the volume of part A decreases and water pressure increases in this part. The increased pressure closes the valve ‘A’ and opens the valve ‘B’. It makes the water of part ‘A’ pass into the part ‘B’ of the cylinder. Upstroke: When the handle of the water pump is pushed down, it lifts the piston up. It is the situation of upstroke. During upstroke, the volume of part ‘A’ increases and water pressure at that part decreases. It opens valve ‘A’ and closes valve ‘B’. Thus, the water from the source enters into part ‘A’ of the cylinder. The water of part ‘B’ is lifted up and it comes out from the spout. Force is an external agent that changes or tends to change the state of a body. It is a cause of pressure,It is measured in newton, dyne, etc. Pressure is the thrust on unit area of surface. It is the effect of force acting on unit area, measured in N/m2. The pressure given by the air in the atmosphere is known as atmospheric pressure. The standard pressure is 1 atmosphere i.e. 760 mm of Hg. 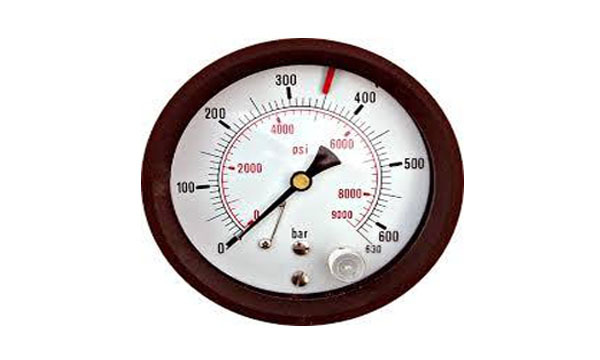 A barometer is used to measure atmospheric pressure. Some instruments based on the principle of atmospheric pressure are: Syringe, Air Pump and Water Pump. Sharp knife cuts more easily than a blunt one. Explain with reason. A sharp knife has smaller area at its edge than a blunt knife. When a force is applied on the knife, The pressure exerted by the edge of sharp knife is more than the pressure exerted by the blunt knife during cutting. Due to this reason, cutting with a sharp knife is easier than cutting with blunt knife. What is the effect on pressure when the area is increased by keeping the magnitude of the force constant ? When the area is increased by keeping the magnitude of force constant, the pressure exerted is decreased because pressure is inversely proportional to the area of surface that receives the force. A man exerts more pressure under his foot when he stands with one foot than when he stands on two foot why ? When a man stands with one foot the area of surface where the force is applied is decreased and as a result the pressure is increased because keeping the force constant, the pressure is inversely proportional to the area of surface that receives the force. The pressure, the force applied is directly proportional to its magnitude, that receives the area. The force that gives pressure is inversely proportional to the area that receives the force. If 1 N force is applied in 1 square meter area, then the pressure will be 1N/m2 and thus, k=1. If a man has mass 60 kilogram and the area of his one foot is 150 cm. What is pressure exerted by him on the ground when he stepped with one foot? This pressure exerted by the man on the ground when he stepped with one foot is 40,000 Pa.
Anupama has a mass of 30 kg and the surface area that her sandal occupies is 150 cm2. Then what will be the magnitude of pressure if she stands on one foot? This pressure exerted by the sandal on ground when Anupama stands on one foot is 20,000 Pa.
What is meant by pressure? Write in which SI unit it is measured. The pressure is defined as “the force acting perpendicularly per unit area”. The pressure is defined as the perpendicularly applied force on a unit area. The SI unit of pressure is N/m2. It is also called Pascal (pa). Give any two examples, application of pressure in our daily life? Food is cooked faster in a pressure cooker than an open pot due to high air pressure. Among the taps of same size and connected to a common pipeline in a house, the flow of water from the tap on the lower floor is more than on the higher floor. Write two factors that affect the pressure. The surface area on which force is extended. What is meant by one Pascal pressure? The pressure developed in 1 meter area when 1N of force is applied is called 1 Pascal of pressure. What are the two aspect of or daily life where there is appliaction of pressure? The two aspect of our daily life where pressure theory is used are: 1. Application of pressure cooker to cook our food. 2. The flow of water is highest at the tap connected at the lowest level from the tank than the subsequent taps above it. What happens to pressure when surface area is increased but the force is kept constant? As we know pressure is inversely proportional to the area on which the force is applied. When area is increased (keeping the force constant) the pressure is decreased as the same foce now has to act on large area so force gets dispersed. A man exerts more pressure under his foot when he stands with one foot than when he stands on two foot, why? When a man stands on one foot the surface area on which is force is acting is smaller compared to when he is standing on two foot. So, as the area is decreased the pressure applied is increased (because force is inversly proportional to the area). So, A man exerts more pressure under his foot when he stands with one foot than when he stands on two foot. It is easier to cut with sharp knifes than the blunt ones. Why? As the knife gets sharper the surface area of the knife's cutting edge have very less surface area. When the surface area is reduced the pressure applied with the same amount of force is increased as pressure is inversely proportional to the surface area. So the knife with sharp edge (having less surface area) cuts easily tahn the blunt ones (having more surface area). If we stand two ladies, one wearing pointed heel shoe and another with flat shoe, in a line. Explain which one will exert more pressure on the ground. The lady wearing pointed heel will exert more pressure because we know pressure is inversly proportional to the surface area and the area of the pointed is less than the flat shoe. ∴Force on the base (F) =? A girl weight 30 kg and surface area of the heel of her shoe is 100 cm2. Find the pressure exerted on the ground if she stands on her single foot(Take g = 10m/s2). Hence, pressure exerted on the ground is 3 × 106pa. Force acting per unit area is ______. SI unit of pressure is ______. With increase in altitude, the pressure of the atmosphere ______. Pressure is defined as ______. The pressure (P) exerted by the liquid is at ______. Any Questions on 'Pressure '?